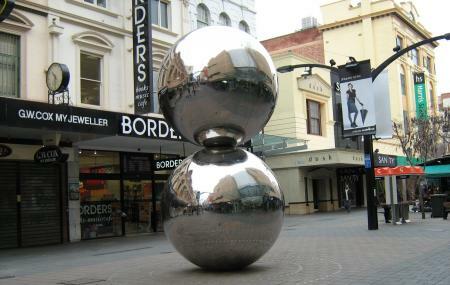 Located in the city centre, the Rundle Mall is the prime shopping area of Adelaide. Opened in 1976 it was Australia’s first pedestrian only street mall. The streets a shoppers paradise. It is home to the flagship stores of Australia’s leading retail brands and has a number of arcades and plazas with shops and boutique selling everything from high-end fashion to electronics. Open seven days a week, the mall is a must visit place even if one just wants to window shop. There are several buskers and street performers entertaining shoppers in the street. Interesting things to see apart from all the merchandise are several modern sculptures located in the mall. The Spheres (colloquially known as Mall’s Balls) a metallic sculpture of two giant spheres is a must see and also a popular meeting place for shoppers. Also worth seeing are a group of life-size bronze pigs - Horatio, Truffles, Augusta and Olive. Other points of interest are the Beehive Corner, The Fountain, The Rundle Lantern and a giant statue of a cockroach. The mall area is always busy especially on the weekend. Visit the Mall on a Friday for some late evening shopping. There is an interactive kids play area at Hindmarsh Square. There is Wi-Fi available throughout the Mall area. Seniors can avail special discounts at some stores. Find out more at Adelaide Visitor Information Centre. Bus Stops: North Terrace, King William Street, Grenfell Street and Pulteney Street. Train Station: Adelaide Railway Station is located only a few hundred meters away from the western entrance to Rundle Mall. Tram Stop: Rundle Mall's western entrance is serviced by a tram service that runs between Glenelg and the Adelaide Entertainment Centre in Hindmarsh. How popular is Rundle Mall? People normally club together South Australian Museum and Glenelg while planning their visit to Rundle Mall. A great variety of shops. Very clean and modern. Only issue is the opening hours on Sundays, but that goes for most of Adelaide so not just exclusive to the mall. Earlier opening times might attract a greater number of people though! The shopping heart of Adelaide. Covers hundreds of shops of varying sizes, Supermarkets to Department stores. Fashion boutiques Even night clubs. Movie theatres Hotel and motels The main mall is traffic free but for odd delivery vehicles mainly in the mornings. Often there are buskers playing various instruments entertaining passers-by. This is one of the highest concentration of shops in an area anywhere. The famous mall of Adelaide with plenty of places to visit. Evertime I visit Adelaide Rundle Mall has had a revamp or shops have moved and new ones moved in so always refreshing to go. Only issue is there is no clear direction on where the toilets are and if you don't know know Adelaide you would not know where they are. A great selection of shops. I had my doubts about the revamp when they removed all the trees and moved the canopy, but there is a great feel about the mall and there are buskers and food pop ups all along it. During mad March and December it is a great place to be and has an awesome vibe. Good old Adelaide. If you're in town, great place to eat shop or just chill. Also 1 or 2 cool places to go when the night begins.